For the past two years, Ricky Skaggs along with his band Kentucky Thunder, his father-in-law’s outfit The Whites, and other assorted friends and relations have staged a series of concerts to celebrate the Christmas season. 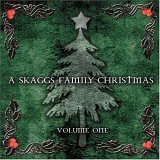 Recorded shortly after last year’s events, his latest album A Skaggs Family Christmas: Volume One finds the entourage running through a balanced blend of spiritual and secular fare, but unfortunately, the end result is largely a mixed bag. At its worst, tracks such as Love Came Gently, Christmas Time Is Here, and Mary, Did You Know? feel cold and calculated, and their pop-oriented string arrangements further erode any semblance of the ensemble’s unique identity. At the other end of the spectrum stand the group’s playfully twang-y interpretation of Let It Snow, Let It Snow, Let It Snow, its delightfully spirited romp through Hangin’ Round the Mistletoe, and its galloping, bluegrass-hued rendition of Deck the Halls. The bulk of the outing, however, falls somewhere in middle, and while Skaggs’ approach is often far too conservative, he and his backing band at least succeed in wrapping the songs in tasteful arrangements that exude warmth and grace. One just wishes that he had shed some of the regal reverence that pervades A Skaggs Family Christmas: Volume One in order to cut loose with his pals and revel in the joy of the holidays.